Lady Suzanne of Greenbriar is Kentucky born and bread, so the Kentucky Derby is one of the most special days of the year for her. Her parents have been to the event several times and our daughter has even played “My Old Kentucky Home” with the University of Louisville Marching Band for Queen Elizabeth (I'm sure the Queen smiled and waved politely). Racing fans and non-fans (but party fans) will eat tons of Kentucky Barbecue and drink lots of beer today. Many in Louisville will be drinking one of the many brews from Bluegrass Brewing Company. Over 90 different BBC beers have been offered over the years and you can always find something unique to suit your taste. Louisville, like many Ohio River communities, has a rich brewing history with Falls City being the most popular. And, in 1977, Falls City representatives approached Billy Carter, brother of President Jimmy Carter, about marketing a signature brand to capitalize on Billy's fame as the beer drinking blacksheep of the Carter family. (Falls City, by the way, was the original name of Louisville – site of the largest water falls on the Ohio south of Pittsburgh It's at the falls where Lewis met Clark, shook hands and started the great Lewis and Clark Expedition). Now, I would be remiss if I didn't mention the other great Louisville drink and tradition: Mint Juleps. Combine water and sugar in a medium saucepan; bring to a boil. Reduce heat to medium and cook for 10 minutes. Reduce heat to low, add chopped mint leaves and simmer 30 minutes. Let syrup stand at room temperature overnight. Strain. 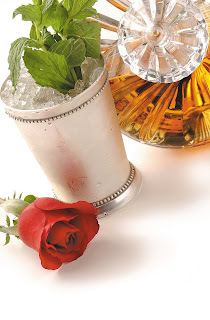 Fill julep cups with crushed ice. Combine bourbon and mint syrup; pour over ice. Garnish with mint. Yields 7 1/2 cups. 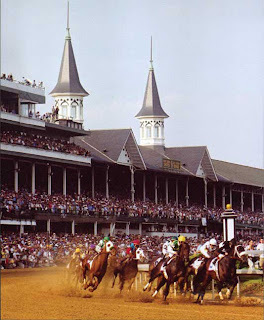 So, whether you're cheering on "Z Humor" at 30-1, "Denis of Cork" at 20-1, or "Big Brown" at 3-1, dust off the Mint Julep Cups and sip a Kentucky tradition. Or, fill a pint mug of your favorite Bluegrass Brew Company beers. I think I hear The Call to Post. Now there's a coincicedence. I have just brought my father back from the Garden Centre Shop and i helped him put all his new Purchases away in the small GreenHouse in his garden. Spring and the warm weather is here, and everything is bursting and green...and i noticed that creeping under the bottom lip of the greenhouse, a rogue Mint plant had spent the winter tunnelling in from outside and up behind a sack of compost, and on revealing the intruder, i said to dad "i'll have some of that to make Mint sauce for the Lamb meals". Now i have another use!! Juleps!! so bourbon is on the grocery list, and i will follow your recipe to the letter tomorrow night. ahhh Northern Comfort. I couldn't help but think that these wonderful horses have names very similar to ours. I'm particularly fond of Denis of Cork, a 20-1 odds. My odds would be better spent on buying a few mint juleps and enjoying the race!